This rustic mixed media wall hanging consists of three reclaimed plywood panels, laced together with wire accented with mismatched glass beads. The panels feature three whimsical crows, one peeking out from each panel. The hanger for the piece is handmade from reclaimed fence wire. Total height is 11 1/4″, total width is 3″ (28.6 cm x 7.6 cm). 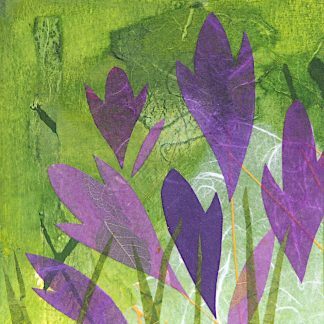 Mixed media wall hanging, two birds Mixed media collage, crocuses, 6" x 6"